The picturesque city of Hyderabad stands on the banks of River Musi and emotes till date the grandeur of the Nizam's who once ruled over this region. The city has to its credit many monuments and structures of the bygone era that still stand here and provides grandeur to the place. Thus, it came to be known as the 'City Of Pearls'. Even today you will be left dazed by the beauty and grandeur of the monuments present here. Those travelling to Hyderabad should make it a point to travel to the nearby regions which too boasts of many attractions that they have to offer. These lesser known places have many forts, monuments and natural beauty that is sure to leave you mesmerised. Here is a guide to the seven tourist destinations around Hyderabad. Click Here to avail 50% OFF on Hotel, Bus and Flight Bookings. Bidar is a city in Karnataka and is located on the Deccan Plateau in the north-eastern part of the state. It shares its border with Maharashtra and Telangana and being the northernmost city of Karnataka it is at times referred to as the 'Crown of Karnataka'. The city is famous for its ancient for which presently lay much in ruins. The walls and bastions of the fortified city are surrounded by a triple moat, and the fort itself is enclosed by seven large gateways. 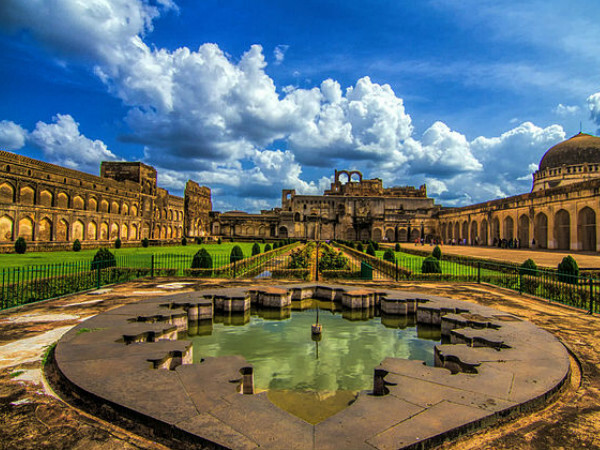 Although its origins can be traced back to the Rashtrakuta Empire it became historically significant when Bahamani sultan Ahmad Shah relocated the capital of his kingdom to Bidar and used the prevailing Persian style to construct the palace. Travellers heading to Hyderabad should make sure they visit this fortified city and see the various attractions that it has to offer. It is just 149 km from Hyderabad and would take around two and a half hours to reach here. Nalgonda is a small town in the state of Telengana. The name of the town is a combination of two Telugu words; Nalla and Konda that stand for ‘Black' and ‘Hill' respectively. There are various attractions in the town that caters to the every need of the tourists coming here. Some of the interesting places worth visiting here are Pillalmari, Rajiv Park, the Phanigiri Buddhist Sites, the Pangal Temple, the Lateef Saheb Dargah, the Bhuvanangiri Fort and many more. All these places hold immense significance in the history of Nalgonda. It is situated 83.7 km from Hyderabad and would take around one and a half hour to reach here. Srisailam is a small town in Andhra Pradesh and holds great religious significance for the Hindus. Located on the Nallamala Hills in the district of Kurnool, the town is established on the banks of River Krishna. It is considered a holy town by the Hindus and is visited each year by millions of devotees from all over the country. The town has famous temples and 'theerthams' that make it a popular pilgrim destination. The most famous of the temples is the Bhramaramba Mallikarjunaswamy temple, dedicated to Lord Shiva and his consort Devi Parvati. It is located 213 km from Hyderabad and you would take around four hours to reach here. Warangal, a district in Telangana was also referred to as Orguguallu or Omtikonda in olden times, due to the presence of an enormous hillock that is evidently carved out of a single stone. It was the capital of the Kakatiya kingdom and there are many ruins all over this region. There are many places to visit in Warangal, but special mention is to be made of the Warangal Fort which finds itself in the travel diaries of Marco Polo. Some of the tourist sightseeing attractions in Warangal include Pakhal Lake, the Thousand Pillared Temple, Rock Garden and more. The town is at a distance of 144 km from Hyderabad and would roughly take two and a half hours to reach. The small city of Kurnool was once the city of the Vijaynagar Kings. Although much of its previous grandeur has been lost, you can still explore the ruins of this great city. Visitors get a welcome feeling here as it is far from the major cities and is a calm place to escape to. Even today Kurnool has its rich history, culture and traditions kept safely here which attracts tourists to this place. Some of the major tourist sightseeing attractions in Kurnool include the Venkanna Bavi Temple, Bala Sai Baba Temple, the Kotla Vijay Bhaskar Reddy Memorial, Kurnool Fort, Nallamala Forest and many more. It is situated 220 km from Hyderabad and can be reached within three hours. Nagarjuna Sagar is an important place for the Buddhists all over the world. This small town is located in the South Indian state of Telengana and apart from being a pilgrim center, the place serves as a very popular tourist destination as well. During the olden days the town was known as Vijayapuri but was later named after a Buddhist devotee Nagarjuna, who was not only an ardent devotee of Lord Buddha but was also revered by the people of the town. Nagarjuna Sagar has some very interesting places for the tourists including the famous Nagarjuna Sagar Dam, the Ethipothala Falls and the Nagarjunakonda. It is located 162 km away from Hyderabad and would take nearly 3 hours to reach here. Formerly known as Rukmammapet and Palamoor,Mahabubnagar got its present name on 4 December 1890 in honour ofMir Mahabub Ali Khan, the Nizam of Hyderabad. This scenic town is bordered by the Tungabhadra river in the south and travellers coming here can head here for a picnic with their family. There are many interesting place to visit in this town namely Pillalamri and Alampur. Also the Kohinoor diamond is believed to be have been from here. It is situated 102 km away from Hyderabad and would take nearly two hours to reach.